Elka Ruvinskaia was born in the village of Novodmitrovka near Kherson in the Ukraine on the 21st January 1876 (or possibly 1874 or 1878). Her family was Jewish and her father ran a small shop. After her studies she worked as a teacher. She was arrested for “political suspicion” in 1895. In 1897 she joined a Social Democrat group around the brothers A. and I. Grossman (who later became anarchists) in Elizavetgrad, and distributed their propaganda. In 1898-1901 she was a member of the Elizavetgrad committee of the Social-Democratic Party and the South Russian Union of Workers. In 1901 she fled abroad, living in Germany and Switzerland where she met Lenin and Plekhanov and worked for the paper Iskra. In 1903 In Switzerland she became an anarchist-communist. In 1904 she returned to Odessa and joined the group Without Compromise which was made up of anarchists and disciples of the Polish socialist Machajski. She was arrested in April 1904 and in the autumn was freed for lack of evidence. She then joined the Odessa Workers Group of Anarchist Communists which distributed propaganda and organised workers’ circles. She began to acquire a reputation as one of the most outstanding anarchists in Russia. She used the pseudonym Babushka (Granny) – a strange alias considering she was still only around thirty! In autumn 1907 Olga returned to Ekaterinoslav and Kiev and after moved on to Odessa. She prepared an attentat against general A.V.Kaulbars, the commander of the Odessa military region, and against general Tolmachov governor of Odessa and an explosion at the Odessa tribunal. 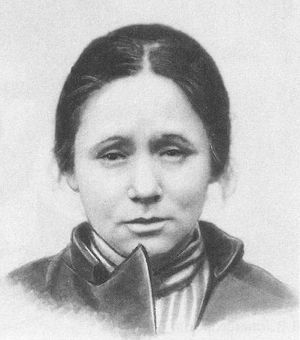 At the end of February 1908 she went to Kiev to prepare the blowing up of the prison walls of Lukianovka prison and organise the escape of arrested anarchists there. However all other members of the group were rounded up but Olga managed to flee. She was arrested at Ekaterinoslav and at the end of 1909 sentenced to 21 years imprisonment. She was freed from Lukianovka prison in March 1917. As Paul Avrich says in his book The Russian Anarchists she was now “a tired and subdued woman in her late forties,” at first keeping her distance from the movement. In May 1918 she organised the Political Red Cross in Kiev, which help imprisoned revolutionaries regardless of their political affiliations, and which once even helped Bolsheviks. By now her old revolutionary zeal had returned, fired by her rising indignation at how anarchist revolutionaries were being treated by the Bolsheviks. In 1919 she moved to Moscow. In June 1920 she took part in the organisation of Golos Truda (Voice of Labour) At the end of September 1920 after the signing of the pact between the Soviet government and the Makhnovists she returned to the Ukraine. In Gulyai Polye she was given 5 million roubles by the Makhnovist commanders. With this money she went to Kharkov and set up the Anarchist Black Cross which helped imprisoned and repressed anarchists. In November Olga was elected as representative of the Makhnovists in Kharkov and Moscow. During the wave of repression against anarchists and Makhnovists in the Ukraine, Olga was arrested. The Black Cross was closed down and its centre destroyed. In January 1921 she was transported to Moscow with 40 other Ukrainian anarchists. She was one of the imprisoned anarchists allowed to attend the funeral of Kropotkin by the Bolsheviks. At the end of April 1921 she was transferred to Orlov prison. In May 1921 the Soviet Attorney General proposed to Olga that she could be released if she recanted her ideas in public. In summer 1921 she joined the 11-day hunger strike of arrested anarchists. In March 1922 she was exiled for 2 years to Velikii Ustiug. Freed at the beginning of 1924 she moved to Kiev. She ceased all activity but kept in personal contact with various anarchists. Mid-1924 she was arrested for making anarchist propaganda, but was soon released. In 1924 she moved to Moscow. In 1927 she supported the campaign for Sacco and Vanzetti (see biography of Nikolai Rogdaev). In 1928-1929 she wrote many letters on the need to organise an international campaign for anarchists imprisoned in the Soviet Union. In 1929 she moved to Odessa where she was arrested for trying to create anarchist cells among the rail-workers. (During this period in the 20s she was involved with the Odessa anarchists in the illegal smuggling of anarchist literature into the USSR). She got a term of 2 years in the “polit-isolator”. She was freed in 1931 and returned to Moscow. She became a member of the Society of ex- political prisoners and exiles which attempted to get pensions for old, impoverished and sick revolutionaries, but without success. In 1933 she was re-arrested and sentenced but documents for this no longer exist. In 1937 she was living in Moscow and worked in a metal processing factory as a driller. She was re-arrested on 27th November 1937, and accused of anarchist and counter-Soviet activity. On 8th February 1938 Olga was condemned to death by the Chief Tribunal of the Soviet Union. She was executed on the same day.